Linhof is a German company, founded in Munich in 1887 by Valentin Linhof. The company is well known for making premium rollfilm and large format film cameras. The company began by making camera shutters, and Linhof developed the leaf shutter, which became part of Compur. Cameras began to be produced from the end of the XIXth century. Nikolaus Karpf, who entered the company in 1934, designed the first Technika model, the world's first all-metal folding field camera, the same year. Revised models of the Technika are still in production. 2.2 9x12 cm/Quarter Plate 3¼x4¼"
The Technika camera line is based around a modular series of standard lens boards. Accompanying these were focusing cams, interchangeable for different lenses, enabling rangefinder focusing in the manner of a press camera. 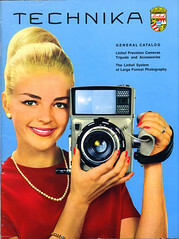 However the Technika cameras offered a greater range of movements (such as back tilt) than the typical press camera. 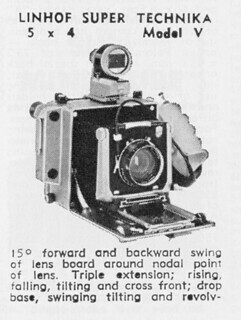 The Technika name was meant to signify their suitability as technical cameras too, used on a tripod with ground glass focusing when greater control was needed. 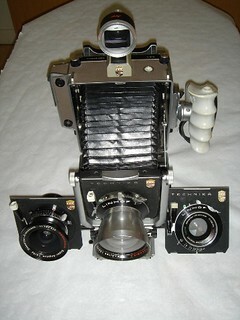 Linhof produces the Technorama series of panoramic rollfilm cameras, in both 6x12cm and 6x17cm guise. This page was last edited on 11 November 2018, at 09:25.